The Sioux Indians were a very powerful and large tribe of Native Americans. The Sioux Indians occupied large amounts of territory that spread throughout the South and Midwest, up into the areas of Minnesota and stretching out west into the Rocky Mountains. In the seventeenth century a French officer named Jean Duluth moved into the area Of the Sioux tribes and the French ended up taking control of many of the territories that belonged to the Sioux Indians. The Sioux tribes were forced to move so they fought there way down the Mississippi River where they fought wars with the French and the Indians that lived in the plains, and eventually the Sioux took possession of the Plains lands. Some of the Sioux did remain in the areas of the Dakotas as others moved into the plains, there were still other Native Sioux that moved into the plains areas of Missouri and joined up with the Southern Sioux Indian tribes that already inhabited the area. In the nineteenth century the population of the Sioux Indians was thought to be close to thirteen thousand and they gave many of their tribal lands over to the United States including all of their land east of the Mississippi River, and again shortly after that they sold thirty-five thousand acres of their land west of the Mississippi River for around three million dollars. The Sioux Indians had also signed treaties with the United States government, and when the US government did not follow through on what they had promised the Sioux became very angry and hostile and some of them began attacking settlers. Many of the Sioux were defeated by the US army and they signed a peace treaty with the government. All was not settled though and other Sioux tribes started revolting because the US once again did not stick to their promises and even more uprisings of the Sioux were breaking out and the Sioux killed more settlers. The US Army subdued and killed many Sioux Eventually the Sioux would settle into reservations throughout the Black Hills of the Dakotas. When the US government found out there was gold in the areas the Sioux settled they once again tried to Force the Natives from the lands and treaties were broken time and time again by the Government, which is the only reason the Sioux became such a hostile tribe against the settlers and government. A well known Sioux Indian named Sitting Bull and a couple other Sioux tribal leaders tried signing a peace treaty with President Ulysses S. Grant but they were never able to come to terms for the Sioux felt like they were being wrongly treated once again. 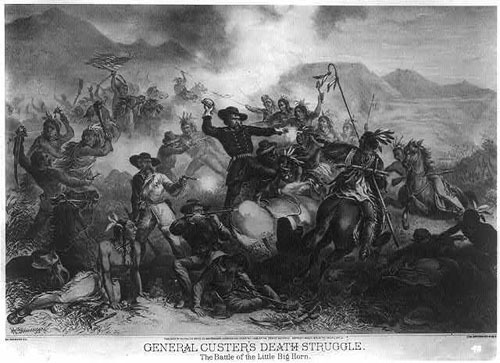 Near the end of the nineteenth century was the infamous Battle of Little Big Horn where the Sioux defeated the US armies of General Custer and this one a big embarrassment to the government and one of the largest victories in Native American history. 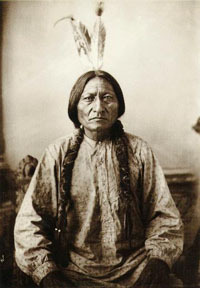 There are many Sioux today still living throughout the Midwest and Plains states and many reservations in the Dakotas.